What Would the Cops Look Like If You Lived in a Futuristic Authoritarian Police State? I’d like you to imagine a crazy, far-out scenario for a moment. Close your eyes and try to picture what it would look like if you lived in a militarized police state with authoritarian tendencies. What do you see? I realize that this exercise is difficult for Americans who live in the land of the free and the home of the brave. We enjoy so much liberty and have absolutely nothing to fear from the cops who now take their cues at the federal level from such upstanding and not-at-all-racist men like Jeff Sessions. But try your best. Imagine what kinds of videos you’d see posted to Facebook from a police force that was out of control and intent on punishing non-violent drug offenders and addicts. Just imagine. It can be hard, but there are all kinds of dystopian movies that might pop into your head like They Live or Children of Men. But that’s not quite right, is it? Are you starting to get a picture in your head? 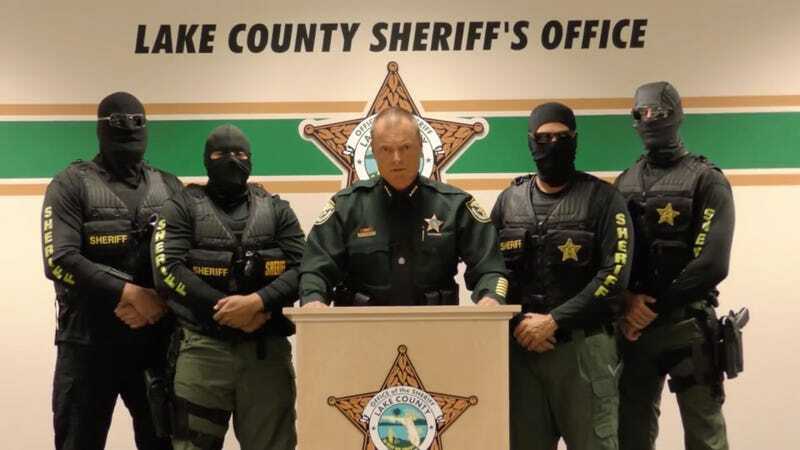 Does it look anything like a man in uniform standing behind a podium, flanked by four armed men in masks and sunglasses? Don’t see anything terrifying? Congratulations! You’re already living in a dystopian nightmare and have slowly become acclimated to the new normal of American civil society!